Stunning views and beautiful property in the heart of the Byron Hinterland. A spectacular secluded country home located at the peak of the Byron Bay Hinterland in Federal with unsurpassed 180° scenic and coastal views. Brand new, architect designed, contemporary 6 bedroom residence sitting in an expanse of private fields bordered by sub-tropical rain forests. With state of the art amenities, including chef's kitchen and flowing indoor/outdoor entertaining spaces, the property accommodates up to 12 people in the lap of luxury. Situated 1 minute from the popular rural village of Federal and only 20 minutes from Byron Bay, the house combines modern coastal and hinterland holiday accommodation. Not far from the bustle of Byron, the holistic offerings of Mullumbimby and the boutiques and cafes of historic Bangalow, the house offers an private calm and welcoming sanctuary. Domestic airlines fly to Ballina airport (approximately 45 minutes drive to Marcel's Place) while domestic and international airlines fly to the Gold Coast Airport (approximately 50 minutes drive to Marcel's Place). Located in an elevated position directly behind Australia’s most easterly town, Byron Bay, the Byron Hinterland literally offers something for everyone. The sub-tropical Byron Bay Hinterland is where you can experience everything from lush conserved rainforests, crystal clear waterfalls, waterholes and creeks to breathtaking lookout points and quaint villages – all within easy driving distance of the stunning Byron Bay beaches. Some of the most popular villages include Alstonville, Bangalow, Billinudgel, The Channon, Clunes, Crabbes Creek, Eltham, Mooball, Mullumbimby, Newrybar, Rosebank, Stokers Siding and of course Federal. These villages are also famous for their popular local farmer and artisan markets held almost every day somewhere in the region. There you’ll find almost everything, including ultra-fresh produce and food, locally created art and craft against a backdrop of performances from aspiring musicians. Famed for its rich soils and optimal growing conditions, the area also boasts many farms selling fresh produce directly from their own roadside stalls. Driving around the area, you will come across a range of eating establishments from fine dining restaurants to eclectic cafes and gastro pubs – many of which pride themselves on using the plentiful local produce of the region, such as organic exotic fruit and vegetables, Bangalow pork, as well as coffee, tea and nuts from local plantations. The Hinterland is surrounded by stunning natural attractions such as Minyon Falls, Whian Whian Forest, Rocky Creek Dam, Nightcap Ranges, Border Ranges and Mount Warning. A number of the parks in the region are members of the World Heritage Listed Central Eastern Rainforest Reserves, home to an abundance of native wildlife including koalas, echidnas, wallabies, flying foxes, kangaroos, various reptiles as well as birdlife such as cockatoos, rosellas, lorikeets, rainbow bee eaters, fairy wrens, kookaburras, kingfishers and kites. We are a family of 6 that fell in love with the Byron Hinterland so much so that we wanted to own a little part of this paradise. We knew of this hidden gem for some time – a plateau at the top of the Hinterland with unsurpassed spectacular views – it was our calling to build our dream home here. It's an amazing and beautiful part of the world. The beautiful beaches of Byron Bay are just a short drive away. The property is set in 54 acres of private fields and forest located within the Byron bay Hinterland. Walking distance from the petite and pretty village of Federal - famous for the Doma Cafe. 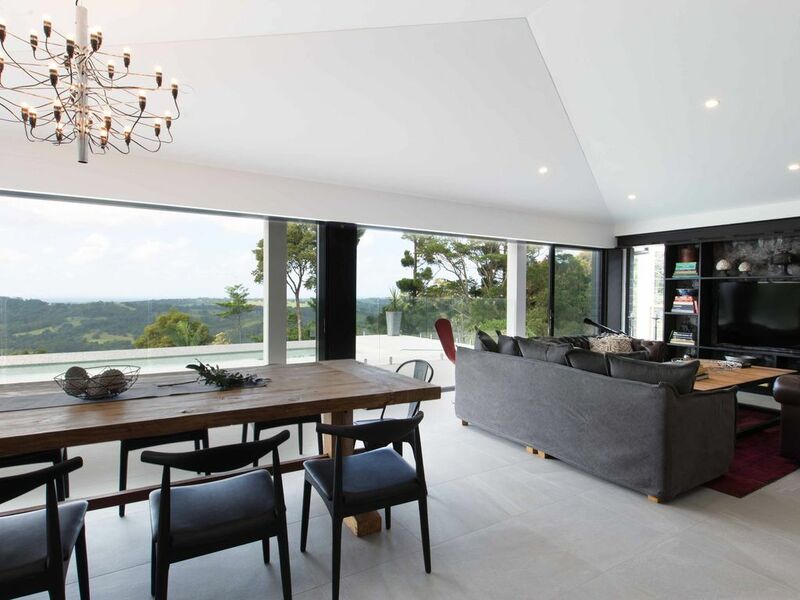 Views across over the Byron Bay Hinterland - the property is on the peak of the hill at Federal. 180 degree sweeping Byron Coastal View. Reverse cycle air conditioning is in all the bedrooms. Aside from the fireplace, there is reverse cycle air conditioning in all the bedrooms. A double sided fireplace that can be used in either the indoor or outdoor living spaces. State of the art gourmet kitchen with high end appliances. Choose between 2 dining areas - one inside and one in the outdoor covered patio. 54 private acres of fields and forests with walking tracks. Huge covered outdoor living space. The house is on one level and the majority of the living spaces are wheelchair accessible - however, it is not specifically designed for wheelchair access. Please drop us a line for specific requirements so that we can see if we can help accommodate. A pool with a view of the Byron Coast and Hinterland. The Wicket is a truly special place. Small wallabies bounced around and beautiful birds greeted our morning. The home has a beautiful open layout and the air conditioning kept us in comfort. We could of stayed much much longer. Very recommended. The Taylor family of a total of 11 had a wonderful time at Wicket Hill celebrating my 80th birthday. An ideal house and beautifully prepared by Haley. Great place, we tried to leave the house best we could in the short time after the water was restored. We had a great time at Wicket Hill, the house was well equipped and big enough for our two families with 5 kids. The kids loved the pool and playing games including the outdoor pool table. We hardly left the house and enjoyed relaxing in and around the home. Federal village, a short 2 minute drive was great for coffee and the famous Doma Cafe which served amazing sushi. We were sad to leave this beautiful home and could have stayed another 7 days. We will surely be back. We are so glad you enjoyed yourselves. You were perfect guests and we hope to see you back again in the future. We had such a wonderful time at Wicket Hill - the house is beautiful and serene with spectacular views. The pool and property are great for little kids with lots to explore. We were a large extended family group with three young children across two families and there was plenty of space for us all. The large kitchen is well-equipped and we were able to easily prepare a special celebration meal. The owner and property managers were incredibly helpful and prompt in responding to our queries. We felt very welcome the whole time that we were at the property. Although it is close to Byron and surrounding towns, we enjoyed relaxing at the home and making the most of the tranquility. We are already planning our next trip! Brilliant new renovation. Stunning views. Perfect for large groups or several families. Wicket Hill was a perfect place for our group of school friends to catch up. It is perched high up on a hill with views towards Byron Bay. It is isolated enough that noise is not a problem. We loved the indoor outdoor fireplace and outdoor pool table. The huge TV was perfect for watching the grad finals on. Amazing house, amazing view, amazing experience!!!! I’m so glad a stumbled across this amazing house. I need a place for my boyfriends 21st birthday that was amazing and big enough for all of our close friends. This home blew me and everyone away, the view was incredible, the house was immaculate and beautifully decorated. The whole process was a breeze. Hayley and Jason were amazing to talk to and made everything so easy. Thank you so much!! Such a great house and would recommend to anyone and everyone!!!! So nice to hear you enjoyed your stay and your boyfriend had a lovely birthday celebration!